When passing through the heart of Goleta on the 101, you can’t help but notice a large open space on the mountain side of the freeway, between Los Carneros and Storke. This is referred to by locals as Bishop Ranch. Over the past few years, this beautiful piece of land has been the object of major controversy, with developers pushing hard to pave it over and the locals fighting to keep it agriculture. But this is not the first time these majestic oaks have seen humans fighting over this land. Some say this man went to his grave early because of it. 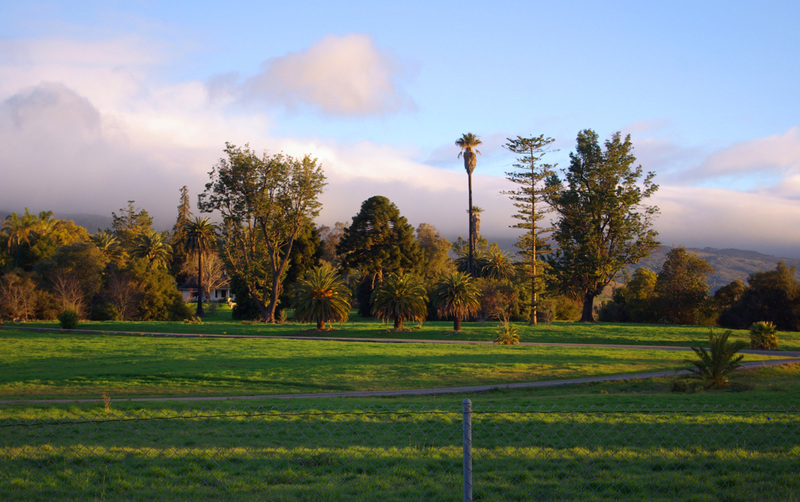 Colonel William Welles Hollister fell in love with the Goleta Valley the first time he saw it in 1854. He was on the last leg of a 2,000 mile sheep drive from Ohio to Monterrey, Ca. and as they passed through, he made a vow to one day live here. He went on to make a fortune with his Ohio wool in San Benito County, and in the 1860’s returned to Santa Barbara, buying up several Mexican land grants, including the Lompoco, San Julian, and Nuestra Senora del Refugio, today known as Hollister Ranch. But he still had his sights set on the Tecolotito Canyon in Goleta. The land he lusted after was owned by this guy, Nicholas A. Den. In 1862, Den died suddenly at only 50 years old and the Tecolotito Canyon was passed on to one of his ten children. That same year marked the beginning of one of Goleta’s worst droughts, and it all but destroyed the cattle hide and tallow business, the main source of income for the Den family. The Den family lawyer, C. E. Huse, suggested they sell of some of their land to help raise some much needed money. Hollister had already expressed interest in buying the Tecolotito Canyon, but Nicholas Den’s will prohibited the sale of any of the children’s land until they were of age. Hollister offered to pay $10 per acre for the 5,100 acres surrounding Tecolotito Creek. An incredible offer, since at the time the going rate was only 10 cents per acre! Hollister was so in love with this land he ignored warnings from his advisers that told him to get the deal approved by a probate court first. He wanted it ASAP, and the Den family eagerly accepted his generous offer. Hollister promptly named his long desired ranch “Glen Annie”, and went to work to make it a national showplace. He built barns, shops, a carriage house and a mansion for his wife Annie on a knoll overlooking the Goleta Slough. He built the first fence in the Goleta Valley and imported many rare trees to plant around the mansion, some of which are still visible from the freeway. Three of Goleta’s streams ran through Glen Annie, and the incredibly fertile virgin soil was soon was covered with orchards of walnuts, lemons, limes and oranges. A leading proponent of Trespass Laws, Hollister built over six miles of fencing and he widened the El Camino Real to 100 feet, thus earning the name Hollister Avenue. He bordered it with palms and pines trees. Remnants of his stately Avenue of Palms still exist today, as does this grand entrance gate. Glen Annie Ranch employed 50 workers, had a full cattle operation, profitable walnut and citrus orchards, and many experimental crops. Date palms thrived and 10,000 almond trees made Glen Annie the largest almond grower in the country. Beautiful lilies burst from the ground, Brazilian banana trees produced fruit, 4,000 grape vines covered the hillsides and 1,000 Sicilian olive trees flourished. Unfortunately, an unusual frost destroyed Hollister’s 50,000 Japanese tea plants overnight, reminding him that even the Good Land has it’s limitations. In 1870 things were going well on the ranch, but behind the scenes, a domestic squabble was growing. Tension between Hollister’s wife Annie, and his sister Lucy, or Auntie, was coming to a boil. Auntie lived with the Hollister’s, and although the mansion was huge, in 1870 Annie insisted he had to choose between her or Auntie. After much negotiating, to no avail, Hollister decided he had to build a separate house. So two miles further up the canyon, a second mansion was built for Annie, and the dispute cleared up. Hollister’s dream had become a reality, Glen Annie Ranch was a horticultural and agricultural showplace. Regular sightseeing tours from the Hotel Arlington brought wealthy tourists and dignitaries to see the beauty of Hollister’s creation. He also became one of Santa Barbara’s leading entrepreneurs and philanthropists, financing and developing such projects as the Arlington Hotel, the Santa Barbara News-Press, Stearns Wharf, and the Lobero Theatre. Hollister is in the left foreground of this photo flanked by both Annie and Auntie. Many lawn parties were thrown at Glen Annie Ranch, often featuring live music performed by Jose Lobero’s orchestra. Kate Den Bell, Nicolas Den’s first born, did not approve of the way their family lawyer, C.E.Huse, had administered her father’s will. She hired a well known attorney from San Francisco named Thomas Bishop to investigate his dealings. When Bishop learned that portions of the estate had been sold without getting approval from the probate court, he quickly accepted the case. When Kate told him she might not be able to afford his services, he offered to work on a contingency basis. His fee would be 50% of any land he recovered for the Den family. If he lost the case, there would be no charge. She quickly agreed. In 1877, Thomas Bishop filed suit against Hollister, Ellwood Cooper and the Sturges Brothers, (owners of Tecolote Canyon), for return of Den property sold out of probate. The trial went down in history as the most important land case of the century in Southern California, and made Goleta Valley the focus of major newspapers from San Francisco to Boston. The courtroom was regularly filled to capacity with Goleta folk, and they considered Bishop the villain, breaking out in hoots and catcalls when he spoke in court. Although he lost the first ruling, he appealed to a higher court, and the legal battle continued on for fourteen long years. Colonel Hollister would not live to see the end of the brutally expensive legal battle. In 1886, Hollister died from “dropsy of the heart” and many believe the stress of the court case was the true cause of his death. While Glen Annie Ranch was only one tenth of his total real estate holdings, it was where his heart was, and losing it was too much to endure. A wildly popular figure, his funeral procession was three miles long, the largest in Santa Barbara history. The Hollister-Bishop lawsuit finally ended in 1890, in favor of the Den family estate. Mysteriously, both mansions on the Glen Annie Ranch burned to the ground shortly after the court’s final decision. Arson was suspected, but never proven. As payment for his services, Thomas Bishop acquired the lower ranch of Glen Annie, which he renamed, “Corona del Mar”, as well as the Tecolote Ranch, today called Rancho Embarcadero. Bishop hired Robert Main to manage Corona del Mar, where he stayed for 39 years. In 1912 Bishop’s son Frank built a new house on Corona del Mar, in the same location as the first Glen Annie mansion. Thomas Bishop did not spend much time at the ranch, preferring his mansion in Pacific Heights, near San Francisco. For nearly half a century, Bishop’s 240 acre ranch was the largest farming operation in the Goleta Valley. In 1952 a dispute arose between the Bishop Ranch and the United States Bureau of Reclamation over the construction of the Cachuma water facilities, specifically the Tecolote Tunnel, which Bishop claimed intercepted subterranean water that would otherwise reach the upper ranch property. The dispute between the Bishop Ranch and USBR was settled through the Cachuma Exchange Agreement, which granted the Corona del Mar ranch 100 acre-feet per year of water. In 1957, the Corona del Mar Ranch was sold to Crown Financial Interests of Chicago, the owners of the Empire State Building. The 100 acre feet of water allotment was lost in yet another lawsuit in 1986. In 2008, developer Michael Keston formed Bishop Ranch LLC to pursue residential and commercial development on the property, which is zoned for agricultural use. The development consisted of nearly 1,200 homes and a commercial center. Project consultant Urban McLellan submitted plans that included three agricultural studies that showed the soil to be marginal at best for profitable crops. Col. Hollister must have been spinning in his grave. In 2011, developer Michael Keston watched in dismay as the Goleta city council unanimously denied his project. Today the Bishop Ranch remains an open space, and while it’s not being actively farmed, the wildlife are enjoying it. More than likely, the developers will be back, to continue the drama of one of Goleta’s precious gems. …or on Highway 101, it’s a pleasure to view, and one of the simple things that make Goleta unique. There is much, much more to this story. If you’re interested, read Walker Tompkin’s books! This is a fascinating article, and will be well-used by some 3rd graders here at Ellwood School. Thank you, Tom, for the great pictures and story!